Yesterday myself and David Elder were invited to the Georgian Embassy here in Malmo at Eurovision 2013 for a reception hosted by The Georgian Ambassador. 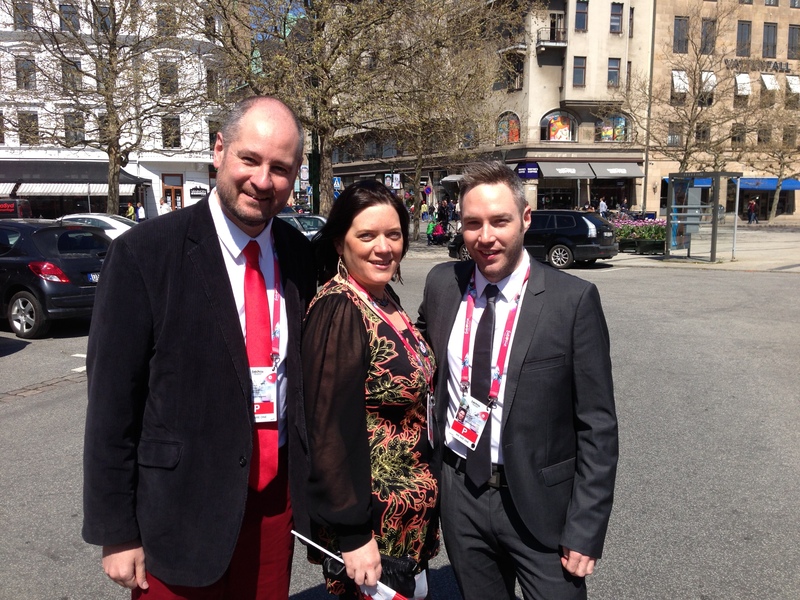 It was a VERY exclusive reception so Eurovision Ireland were pleased to be in attendance at this event. We got dressed up in our Sunday best and joined Dr Eurovision before heading to the embassy. The Oddfellow Palace was the address – certainly made me giggle. We ended up on the wrong floor and just about let ourselves into some poor boys apartment. He had lovely sofas and I am sure would have made us an afternoon cup of tea but off we toddled up the stairs and WOW what a reception it was. We were welcomed by Tinatin, on of the Georgian press ladies who gave us a guided tour of the buffet table!!! – obviously us Scots look like we love our food. We were then told to help ourselves to wine and then the Ambassador welcomes everyone to the Embassy. There was a 10 minute presentation on Georgia including their history, their people and their culture. It was very interesting and what a beautiful country it is. Scenery to rival Scotland!!!!! Nodi and Sophie entertained us with some of their favourite Georgian songs and it really made for a classy event. We tucked into various Georgian delicacies once the presentation had finished and of course topped up on the wine!!!!!!!!! We chatted to Nodi about Georgia and put in a suggestion that if they win we could be the hosts from the green room. I am sure Tinatin noted it down 🙂 Nodi said we should visit Georgia regardless of if they win or not. David and I have taken that as a personal invite and will get his address before we leave. By far the biggest surprise for us was the gifts that we received from Tinatin and the Georgian delegation. We have joked about having our coronation and being crown Queen and Queen of Georgia but you could have floored us when we were presented with Georgian Hats that come from the highest mountains in Georgia!!!!! We wore then for the rest of the reception and will be sporting them on Thursday for their semi final. The afternoon finished off with Nodi and Sophie, performing their song Waterfall. It gets me every time and is just beautiful. It was a fantastic afternoon and we were very honoured to be there. Just to top off the day as we scooped the last of the wine and stumbled off down the cobbled streets towards home, we bumped into the Georgian delegation once again and they joined us in a rendition of Waterfall in the middle of the square – experiences you just can’t buy!!!!!!!! Sounds like a lovely time was had by all.